This is the current edition. The full contents of the 2009 Edition are available in HTML format. The 2003 Edition is also available in HTML format on this Web site. Earlier editions of the MUTCD are available in PDF format only on this Web site. Certain Chapters of the MUTCD Millennium Edition (those affected by Revision No. 1 changes) may be viewed in HTML format, in addition to PDF format. Disclaimer: The MUTCD HTML format is accessible to individuals with disabilities, per Section 508 of the Rehabilitation Act. While every effort has been made to assure consistency between the PDF and HTML files posted on the MUTCD Web site, it is possible that the HTML files may not be totally identical in content to the PDF files. The PDF files constitute the official version of the MUTCD and always take precedence over any potentially conflicting MUTCD text or figures that may occur in the HTML files. 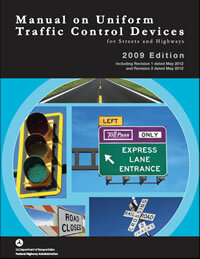 The PDF version of the MUTCD 2009 Edition is optimized for printing on a color or black/white laser printer. Go to the 2009 MUTCD (PDF) page for further details on printing.